Innovation shouldn’t just be about coming up with a new product or a new approach, it’s also about in what way we can reduce our efforts and make our life easier. In Ahmedabad, we have noticed such innovative product named “Spoonzo”. ‘Spoonzo’, an app is developed by Azilen Technologies,not only carries a unique name, but also has strinking unique features. To start with, Spoonzo is a food ordering app available on iOS and Android platforms and it’s free to download on both. That’s right, imagine your smart phone taking your order at a restaurant! Spoonzo offers exactly this service. A simple user friendly app, works on a very simplified process. First you need to download app to your mobile device and have to follow one time registration procedure. Later, just by scanning a QR code that is displayed on the table in the restaurant, the entire menu will be displayed on the mobile screen within a fraction of seconds. 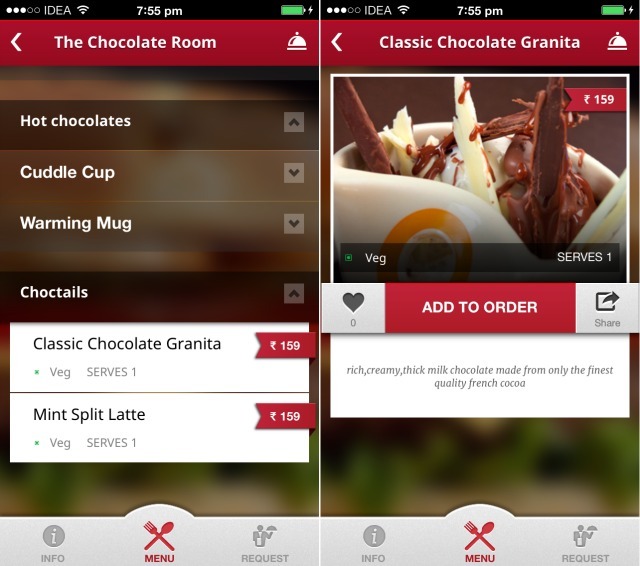 Thus, you can easily navigate entire menu of the restaurant on the tiny mobile screen. 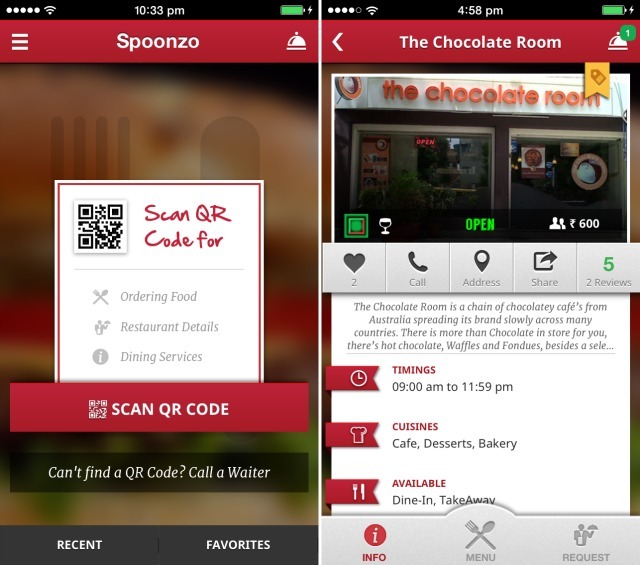 Spoonzo: a mobile app designed specifically to revolutionize the way customers interact at restaurants. So, what makes this menu unique? Spoonzo is unique as compared to paper menu. 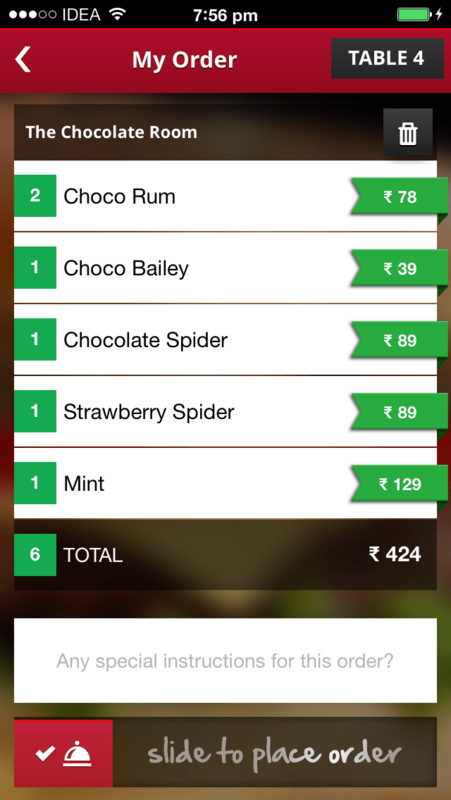 Below are the screens of a menu of The Chocolate Room, in 1st screen, you can see the category of menu and different dishes with its price. The 2nd screen of the menu is fairly eye-catching and informative too. On this screen we can see the name, image and a list of ingredients / few words related to the dish to place an order. Here you can also find 2 more options: mark this item as your favourites and share with your social networks like Facebook, Twitter Instagram and more. You can review your order by clicking on the Spoonzo icon at the top right corner of the screen. At My order screen you can review your items and total amount of your bill. Spoonzo also allows us to add our special note / instruction with our order. Slide from left to right your order is placed! In general, we call a waiter to ask for a tissue or for water. 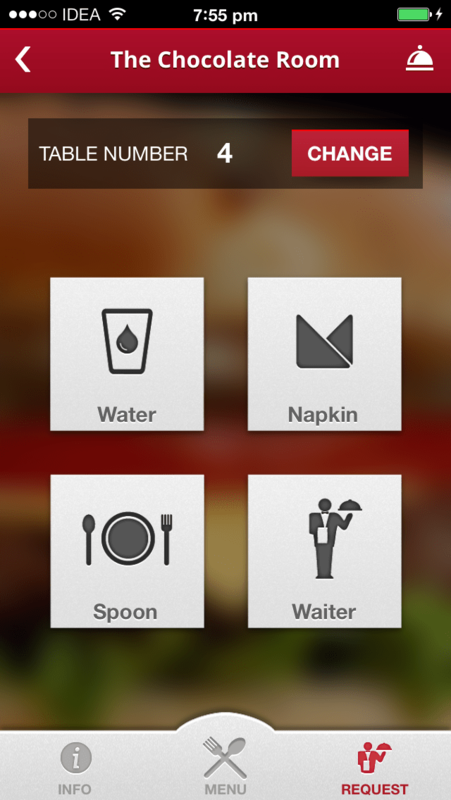 With Spoonzo, you can place a request for Water, tissue spoon / dish etc. from your phone itself and within a blink of your eye your requested item will be at your table. What makes Spoonzo a must-to-try-out-app? About the author: Nikhil Makwana is a internet marketer and blogger based out of Ahmedabad. He loves to find innovative things and likes to share it with others. You can follow him on Twitter.